Vacuum leak testing is a principal leak test method for examining any sealed parts that could have leakage in their housings, casings, or attached lines. While the Hawk CVM can be installed in many applications, it was designed with the groundwater application in mind and, in particular, to check for leaks in the chlorine injection process. The Hawk CVM (Constant Vacuum Monitor) provides the peace-of-mind that you are always supplying safe, clean water to your customers. The Hawk CVM connects into your SCADA network and will send you an alarm through a text or phone call if your chlorine tank is empty or your vacuum is too low. Industry standard 4-20mA output, corresponding to a vacuum of 0-29.6 inHg (0 to -14.5psi). All external parts are non-metallic to minimize corrosion in a strong oxidizer environment. The vacuum transducer is protected from direct contact with the process chemical by a food-grade barrier fluid. Many harsh gases can be measured with the CVM; including chlorine and sulfur dioxide. If vacuum level increases from normal range, this normally indicates that chlorine tank is empty, tubing is pinched, or regulator is defective. If vacuum level decreases from normal range, this normally indicates that chlorine tubing has cracked or that the injector is clogged. Can be connected to existing monitoring or automation systems with a simple 4-20mA input. Can be used without any existing monitoring system by connecting to a Hawk CVM Head Unit. A stand-alone level range monitoring device. This unit interfaces with a standard 4-20mA measuring device. The user can set high and low alarm limits. If the reading drifts outside of these pre-defined range limits, an alarm relay output is engaged. Available with or without remote connectivity. Cellular and WiFi versions allow remote website trending and alarming via text message, phone call, or email. Powered via 120VAC or 24VDC. Can be used with any 4-20mA device, natively designed for the Constant Vacuum Monitor. When used with the CVM, the head unit allows the user to monitor the entire injection process. Monitor and alarm based on the vacuum level. 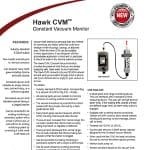 Click on the image at left to download the Hawk CVM product sheet.